RX115 urinal screens are a unique combination of a gel screen screen infused with our fresh herbal fragrance and our proprietary odor counteractant, Airicide®. This is the only urinal screen on the market today that offers this combination. Its low VOC’s allows it to meet the most stringent of standards making it compliant in all states. Use of this product will allow a minimum of 2000 flushes before it needs to be replaced. Remember, foul odors are bad for business and the RX115 Urinal Screens will help eliminate foul odors so common in bathrooms. 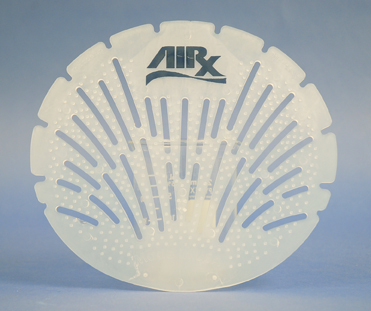 Airx Labs can help design a complete bathroom maintenance program to help it smell clean and herbal fresh. RX 115 is a Sub-Surface & Airborne odor control product.